Discussion in 'PC Gaming & Rigs' started by MeganElisabeth, Dec 20, 2016. I'm looking for the best gaming pc $1500 and under. Yes, I've seen stuff about building my own but there is absolutely no way I could do it and also through even trying to build my own online starts becoming way more expensive than the sale prices of premade ones with the same specs. There is also nowhere local to build it for me. So I am set on this. How do I choose? Is there a site like rtings.com does for tv's? Looking for a pc to use my 55" 4K as the monitor. 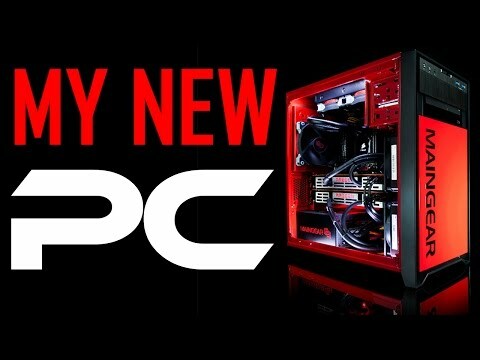 Are iBuyPower or CyberPowerPC's decent company/computer? I'm finding the best prices for these brands so I can either get a more expensive name brand one (MSI/Asus) with lesser specs or one of the former above listed brands with better specs. I'm definitely wanting GTX 1080 and i7. I am split on getting a laptop that isn't caught up with how the desktop are because that's all I've ever known for gaming and writing. I really want to use my 4K tv screen for the moniter but am concerned it will stretch the image and make it blurry? Can you change the size a game is on the tv screen through the laptop? That's my only concern. Otherwise I know the desktop is the absolute best option. Any and all advice is more than welcome and extremely appreciated! It's literally as simple as putting Lego together. I will never recommend prebuilt. It's several hundreds of pounds more expensive. I'm sorry but prebuilt being cheaper is a lie. It is never cheaper. I would like to understand exactly why you think you are not capable of screwing stuff together and putting items in slot? If you're going to use a TV, accept the fact you will have crap response times compared to monitors by a huge factor. That's seriously all it involves like literally just screwing something and putting into a slot? If so, I wonder why most are always against doing it themselves and why there are YouTube tutorials on building your own PC? /: Really? Even sale prices? I was looking into this one specifically and when I've went to look at parts it is more expensive than the prebuilt... after sale price not the original price. The problem with pre-built is it's not always clear what quality of components are installed. In the link above most are from ADATA (who I've never heard of) so who knows how good they are. DIY means you can specify exactly what manufacturer parts to install and so get the best spec around. Especially for the money. A big plus of pre-built though, especially from a good builder, is that it should be tested throughly before you receive it, and if you have any issues you should have a good direct line of support. Get the right company and you get a good warranty yourself. I can't recommend anyone in the US, but there's several UK suppliers who I'd say to have a look at. As always, do your research before buying. DIY means you have to debug it yourself. Which can be fun, and there's plenty of help online, but it can also be frustrating if there's a fundamental fault somewhere. So this testing and support is what you pay on top of the components. Companies are out there to make money, so if it seems too good a deal, it probably is. Personally I'd always DIY, it gives you a great sense of satisfaction and you get to learn a lot too. Well worth it. BTW I use my PC at 1080p on my 4K TV and it looks great, a decent 4K TV should be able to reproduce a 1080p image properly. Unless you're playing games that require fast response the TV shouldn't introduce any perceptible lag, although some TVs are better than others. My Panasonic CX680 is fine to my eyes. It's literally as simple as putting Lego together. Simpler even - I spent about half a day in total over a weekend putting my PC together. By comparison, it took me a week of evenings to build a complicated Lego Technics model! But as mentioned, unless you are incapable of using a screwdriver (and maybe a pair of clippers to trim zip ties), you can build a PC. The trickiest part is actually assembling the list of parts - that requires some basic planning and research (there are a number of really good channels on the YooToob that can help). Like the OP, I was planning on just buying a prebuilt system, didn't want to bother with the assembling it myself. But I'm glad I changed my mind - it was actually an incredibly enjoyable and satisfying experience, and you get exactly what you wanted. As Eddy says though, prebuilt systems have the advantage of being set up and pretested before you get it. In terms of retailers I felt I could trust, CyberPowerPC is one I considered, as is Overclockers and Scan. Hi @MeganElisabeth, like everyone's said, it's child's play to build a PC nowadays. The most time consuming part is choosing the bits and bobs . The actual build only takes an hour or so. We're here to help so if you fancy doing this, send us a shopping list of components (case, CPU, motherboard, power supply, RAM, GPU, HDD, SSD) and you'll get constructive feedback. For the build itself, all you'll need is a screwdriver and no distractions. I don't think that building your own PC is cheaper - it used to be years ago but not these days. However, the benefit to building your own is it will be exactly the specification using exactly the components that you want. If you have a spec in mind then it is unlikely that you will find its exact match as a pre-built. Where pre-built comes in to its own is if you are flexible with the spec or would prefer someone else to spec it for you then you are likely to find a good machine that you could not build for the same price. Another reason why people by pre-built is peace of mind and warranty. Building your own machine is simple, I have have built many myself, and it is just a matter of plugging all the components together with cables. 99% of the time you will power on and it will burst into life, but whta if it doesn't. Chances are you have bought the compinents from different places so its down to you to work out what the problem is, whether any of the compinents are faulty and if so which one so it can be returned. Likewise, if it develops a fault months down the line it is up to you to work out the faulty component, identify the fault and return it. With a pre-built it is up to the supplier to support any fault thta develops. have a look at the likes of jayztwocent ,bitwit and paulshardware on youtube , their have many vidz showing you "how to build a PC"
Or you could even pick out the parts that you think you may need , and post them here ,and we will more than happy to take a look at the list and tell you if you have some right choices or if something won't work .